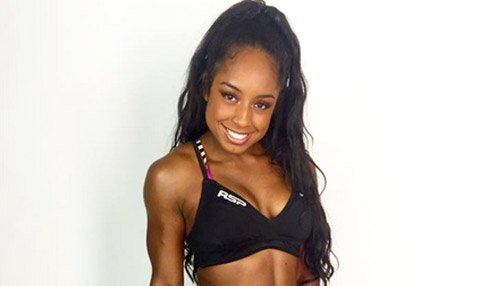 How Instagram Phenom Qimmah Russo Makes Fitness Fun! From the basketball hardwood to the weight room, Southern Californian Qimmah Russo's journey to fitness is all about keeping it fresh and fun. Get her secrets! Qimmah Russo is like a lot of college students. The sophomore guard on the basketball team at College of the Canyons in Santa Clarita, California, carries a full academic load studying kinesiology and sociology, and yet she somehow finds time to commit to fitness amidst all the madness. But Qimmah—pronounced "Key-ma"—is different from her classmates in many ways. Few of her peers run a fitness company, engage in personal-training services, and inspire thousands of others to actively engage in the fitness lifestyle. In fact, the 21-year-old has close to 600,000 Instagram followers. She's even teamed up with RSP Nutrition to help the supplement company spread the gospel of health, fitness, and good nutrition. Most recently, she was featured on the cover of Train for Her magazine. Despite her youth, Qimmah has found a fitness formula that has sculpted her own physique and inspires countless others as well. How has she been so incredibly successful, and what drives her to get better each day? Qimmah shares her insights with Bodybuilding.com! What qualities separate the successful from the unsuccessful in the gym? The number one thing for me is dedication. I'd also have to say that, to really get results, you have to maintain intensity; you can't just go through the motions. Focus on what you're doing; focus on using good form. Passion is incredibly important, too. You'll put more effort into something when you're passionate about it. You've got to enjoy what you're doing to be passionate about it, so pick activities you actually like. And be consistent. If you get to the gym only 1-2 times a week, and then miss a week, you won't achieve results. This has to become a way of life; you have to be consistent with it. What's the biggest mistake you see people make in the gym? Socializing more than working out. It's OK to have fun while you're training, but once you're talking more than you're lifting, it's annoying for the rest of us who are more serious. Now that everyone carries a phone to the gym, too often you see people texting between sets, again slowing down their workouts. How can you maintain your heart rate when you're not training? What's your basic training approach? I'd describe my approach as athletic-style boot camp. It's a combo of strength training and conditioning. You don't just lift weights or do curls; instead, you're gonna be walking on your hands up and down the turf. The idea is to build up your entire body using a mixture of activities that allows you to attack it with several different styles of training. This is how I work out. If you have a stubborn body part, what's the best strategy to bring it up? Make the exercises that target it more intense, maybe do them for longer duration, and keep the exercises fresh by switching up movements from week to week. That's what I've found ensures the muscles don't stagnate. What's the most overrated exercise in the gym? Cardio machines. Machines sometimes enable you to be lazy. I believe in using my own body to get my heart rate up. It's an old-school approach, using things like calisthenics and bodyweight exercises, even sometimes including added weight. You'll get better results that way, in my opinion. I want to go outside and run, whether it's the track, canyon, or sidewalk, I like to take it outside. 25 Grams of Protein from 4 Protein Sources! Ultra-Filtered for Maximum Bio-Availability and Absorption! What's the most underrated exercise? It's really a technique: Keeping exercise fun. You have to make it exciting and fresh. I don't want to be sitting on a treadmill for 30-40 minutes. You've got to enjoy the process of working out. What's your favorite overall movement to build muscle? Squats. I'm a big squat person, because squats recruit the largest muscle groups of the body, and I love training legs. They even call me Quadzilla around the gym. I don't follow a traditional approach of 3 sets of 10 reps when doing squats, though. I may squat for 30 seconds, or do as many reps as I can with just the bar on my back, or do them as part of a circuit. I don't really do them in a traditional sense. I use a lot of variety and push myself past my limits. Again, I believe in about keeping exercise fresh and exciting. What's the biggest mistake you made in your early training days? I'd say overworking my body. I don't need to overwork my body—too much volume, too much frequency—to get the results I'm looking for. Having balance wasn't something I learned until later on. In the beginning, I'd also say not knowing correct form—that just comes over time with experience. What's the best training advice you've ever received? Setting your mind to "I can" rather than "I can't." It's an attitude adjustment I learned from one of my coaches. "Can't" wasn't something in his vocabulary. From that lesson, I learned how to approach challenges from a different perspective, and the results were just incredible. When people ask you what your secret to fitness is, what do you tell them? I say that it's a combination of mindset, your diet, and how you work out. Those three together create the miracle right there. You have to put in the work, and it starts first and foremost with your mind. If you're not in the right headspace, it's just an uphill battle—but it doesn't have to be!